So, tell me, have you ever made spaghetti squash? This was the first time I ever made this veggie. Of course, everyone tells you it turns out like spaghetti but I figured sure, sure, sure it does. I mean, how close can a squash be to spaghetti? Well, hold everything!!! This thing really DID resemble spaghetti. Totally shocking. Add some carbonara sauce with bacon and hellllloooo happiness! This was a fabulous dish!!! Preheat the oven to 375 degrees F. Prick the squash all over with a fork. Sprinkle with 1 tsp salt and ¾ tsp. pepper. Roast on a foil lined pan 1 to 1½ hours. (I did 60 mins but would go longer next time) Let cool a bit. Slice in half lengthwise, scoop out seeds and shred the squash with a fork. Transfer to a large bowl.In a large saute pan, over medium heat, cook the bacon until it becomes crispy. Add the garlic. Saute for 1 minute. Add the broth and cook until the liquid has completely evaporated.In a medium bowl, whisk the eggs together with the cheese. Season with the remaining salt and pepper. Combine the eggs with the bacon mixture, warming the eggs in the pan. (Do not let the eggs cook through.) Add the spaghetti squash and toss to thoroughly combine and until squash is heated through. Adjust seasoning, if necessary and serve immediately. 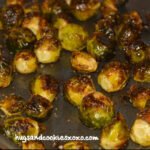 BRUSSEL SPROUTS!!! OMG…WHO KNEW HOW DELISH THEY ARE!!! This looks delicious. I have to try this. I steam my spaghetti squash in the microwave. I cut it in half, remove the seeds and put it in a glass dish with about an inch of water and cook on high for 12 minutes. I cover it with plastic wrap. I usually cook half at a time. The only thing I would say is don’t use plastic wrap when you cook. The BPA’s in the plastic leech into your food and are toxic to you. Use parchment or waxed paper, or a glass lid. I do the same thing, but without the wrap and it works great. We have spaghetti squash a lot more often since I’ve found this method. I poke a few holes in it with a fork and put the whole squash in the microwave for 5 mins. This makes cutting it in half a breeze (use oven mitts). Scoop out the seeds, place cut side down in a glass dish with a 1/4 inch of water and cool for another 5 mins. It all scoops out perfectly. Such a time saver. Also – just made this tonight and it was fantastic. My cheese and egg mixture was a bit thick bc my cheese was grated, so I added a bit of white wine (from the glass I was drinking lol) and it was amaaazing. Hubby loves it too. This recipe is definitely a keeper. I made this for dinner last night and it was AMAZING. I added about 1/3 c of heavy cream when I added the eggs and parmesan to make it a bit creamier. It seemed like a lot of pepper – but it is just right. We really loved it and had the leftovers for lunch today. I will definitely make this again! When you use heavy cream do you use less chicken broth? No, but pasta water is. I bet the chicken broth replaces that. Ok, just made this recipe, it is AMAZING! I am doing weight watchers, and haven’t calculated the points yet, but will definitely be lower than regular carbonara. And a great way to sneak a vegetable into my 4 year olds diet. Will pass this on! Do you know how many servings this yields? Depends if it’s your main dish or side dish. Served two in my house. Did you figure out the Weight Watchers points? I would really appreciate it if you could share that. I just figured the points and I got 3 servings out of it. It was 8 ppv. It would be 6 ppv if you had 4 servings. Hope this helps! This sounds delicious! Carbonara was one of my favorite pasta dishes growing up. As an adult I’ve almost completely swapped spaghetti squash for actual spaghetti in my house. I love the “lighter” version of your carbonara. I’ll have to give it a try! I have tried sp squash a couple times, I like the texture but it is the tangy taste i cannot get beyond. Do you have suggestions toellow out the natural taste? I’ve made this twice in three days. Needless to say, we LOVE it! The only thing I did differently was add a little more bacon, and we cook the squash in the microwave to save time. Thanks for a great recipe! How long in the microwave?prick it all over and microand ave whole?I don’t like roasting or using the oven for that long! Split the squash lengthwise and scoop out the seeds. Lay one half in a baking dish, fill the depression with water, and put the second squash half on top, fitting it back together like a puzzle. Microwave for 10 minutes (no plastic wrap, which should never go in the microwave on food). I just finished this recipe. I added about 2 tablespoons of light cream to improve texture and just a few chopped onions to the bacon mixture. It is truly delicious. Thank you for a wonderful recipe. I made this tonight according to your recipe. It was fantastic! Even my son who hates vegetables liked it. Thank you! My husband loved this dish. I used a rather larger squash so I needed 6 strips of bacon. I also added some onion and parsley to amp up the flavor. Also another tip…cut the squash in half and roast on the baking pan with the cut side down…it was done in 20 mins. 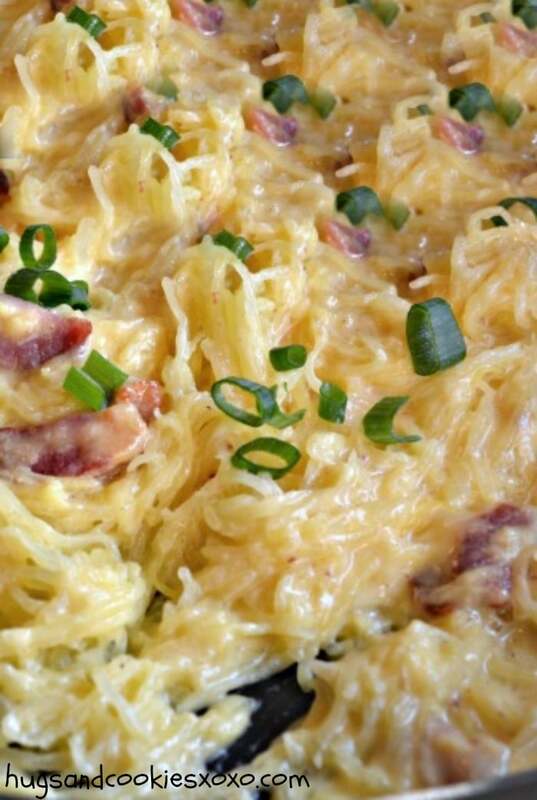 My mom often made a spectacular spaghetti carbonara when I was growing up. Her recipe called for a ton of butter and heavy cream. Since going to college, I’ve started looking for healthier food options and when I came across this recipe I had to try it! I made it tonight with my boyfriend, who was very skeptical about spaghetti squash. Not only did I think this recipe was amazing, but it also satisfied his picky taste buds! I think we found a new favorite recipe! Thanks for sharing. I cook mine in the microwave and that is the only method that has worked for me. I use a carving fork (I have a pointy one) and stab it several times all around and pop the whole thing in the microwave. I start out with 10 minutes and then I press on the skin to see how much give/how tender it is. Then I cook at 5 minute intervals until it feels right to me. Usually for a large one it is around 20 minutes. I then wait about 5-10 minutes and I cut it in half lengthwise scoop out the seeds and use a fork to remove the strands. Comes out great every time. I made this tonight (with a little added cream)! My hubs and I are on Atkins but we have two kids that aren’t, so I made the sauce, poured half over pasta and half over the squash. Worked great and everyone loved it! This is my first time ever having spaghetti squash and it was a great introduction. I cooked spaghetti squash too but do you have any tips to share for it not to be to too watery. I noticed that as the spaghetti squash cools off it gets too watery. Is this something to do with being cooked in the microwave? Hi! This looks wonderful, but are there any concerns about the mostly uncooked eggs? Eggs are actually pretty safe now, even raw, because they are pasteurized to kill bacteria etc. If you are using farm fresh eggs this will not be the case, but again, many people can consume these safely. It should say on the container if they have been pasteurized or not. The main exceptions to eating raw eggs would be pregnant women, the elderly and those with compromised immune systems. Also, in a recipe like this, the eggs do get cooked to a degree and aren’t actually raw. They are tempered, by heating them gently so they don’t scramble. I am not one to eat raw eggs, I mean I don’t even like uncooked whites in scrambled or sunny side up eggs, and I LOVE carbonara. Absolutely delish! 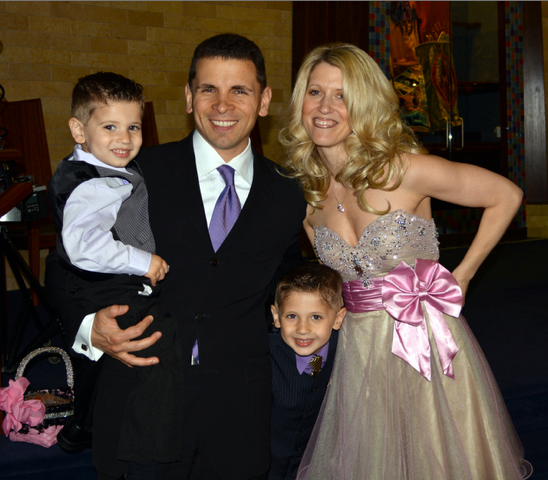 My picky husband even liked it! Will be adding this to my regular low carb items! Thanks! This looks really good. I’m just trying to figure out Paleo and haven’t tried much yet. Slightly confused – the ingredient list states the squash should be cut and seeded, but then the instructions say once it’s cooked to then cut and seed it. Do I roast the squash in half or whole? Sorry Chelsea! Roast it whole and then cut…much easier that way and that’s how I did it! This was great and filling! I used half the salt and pepper, added 1/3 c heavy cream and added chopped grilled chicken. This was our first time having spaghetti squash and I was pleasantly surprised. Much better than having cauliflower “rice!” My teenage son went for thirds! That is awesome when it is teenage approved! I’ve never made spaghetti squash before but have all the ingredients for this. Can you tell me how I know if my squash needs to be cooked longer or if it’s been overcooked? Thanks! 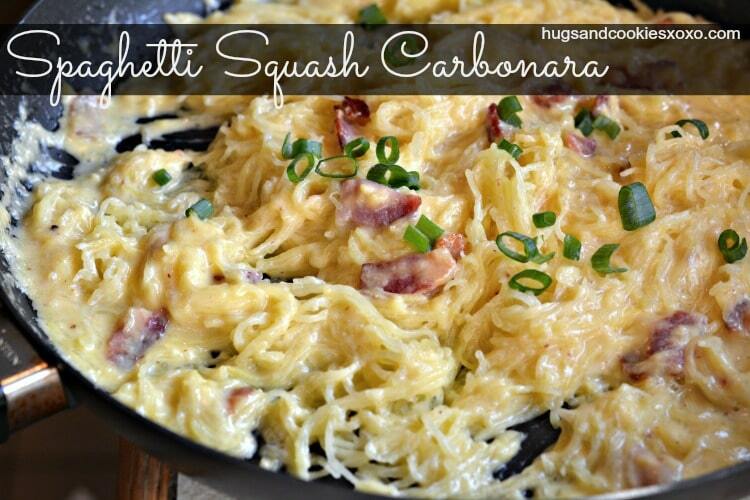 This spaghetti squash carbonara was great! I added some chopped kale for color and nutrition. I make spaghetti squash all the time and it’s equally good with tomato sauces of all kinds, but this sounds amazing! I’m excited to try it. I cook spaghetti squash in the microwave this way: Cut in half and remove the seeds, then prick with a sharp knife. Put a bit of water in the bottom of a shallow bowl or plate with half the squash, cut side down and microwave for 11 – 12 minutes. Don’t use plastic wrap as (a) plastic in the microwave releases toxic particles into your food and environment, and (b) it makes the squash soggy. Turn cut side up and let it cool a bit before you use a fork to twirl out the strands. I stuck my spaghetti squash in the microwave and the stem caught on FIRE after 30 seconds! Yikes! I definitely prefer the oven method, but I cut mine in half first, brush with olive oil and then stick it in. Thanks for the recipe! OH NO!!! Glad it was ok! This is fabulous – I just made this for myself and my husband and it was perfect – one of the most satisfying paleo/primal meals I’ve ever had. Thank you! So glad to read this!!!! Is there really 2 teaspoons of salt? If you split this for two for a main dish that is over a teaspoon per person. Otherwise it sounds divine and will be trying it this week. Anyone have the nutritional break down of this? Looks amazing! One question, I’m allergic to eggs are they necessary or is there a substitute? Did you drain off bacon grease? You can if very greasy. My sauce wasn’t creaming- turned clumpy. Did I let eggs cook? Any recommendations!? Made this last night and was soo happy I did. A light meal that actually fills you up! I used pancetta instead of bacon and threw in some frozen peas when I added the garlic. So yummy! Im excited to keep this as a regular meal! Is spaghetti squash sweet like butternut squash, or more like zuchini? I don’t enjoy sweet squash. Thanks! Not sweet. It doesn’t actually have a lot of flavor on its own, which makes it take on the flavors of whatever you add to it. Just made this for lunch. Amazing! I changed the recipe a little. Used turkey bacon, added onion and baby kale and used only half of a cup of Parmesan cheese. Calculated about 425 cals for half of this entire batch (based on my ingredients). Thanks for sharing this recipe. I’ll def make it again! This was incredible! I made a few additions that, I think, really made this meal shine. I added sliced polish kielbasa sausage in with the bacon, and added onions, mushrooms, and spinach with 2 big cloves of garlic. I also sliced the squash in half before baking it for 40 min @ 400 degrees, and let the water strain out (after shredding) while I was preparing the bacon, sausage, and vegetable mixture. It was absolutely fantastic! By boyfriend and I scarfed it quick. Definitely making this again. Thanks for sharing!! This was soooooo good! I have never commented on a recipe before, but I have to say this is a favorite! I did drain the bacon a little bit before I added the broth and I already had the spaghetti squash cooked from an earlier recipe, but other than that I followed the recipe as written. I will be making this again and again! Thank you for sharing this. Also, I did reply to the question about Weight Watcher’s Points Plus Value. For four servings it worked out to be 6 ppv. I got three servings out of it so that bumped it up to 8 ppv. I’ve never had spaghetti squash before. I tried this recipe and fell in love. It was 100% amazing! I will be making it many more times to come! Yummy! I followed what someone else suggested and cut the squash in half and baked it. It was done in 40 minutes. You can cook spaghetti squash in the crock pot! If you put it in the microwave it kills all the nutritional value in it and defeats the purpose I n eating it! I must try your recipe with the exception of how I do my spaghetti squash. Here’s how I do mine, you might want to try it and if anyone has kids this is a great way to get them involved in making the meal. I cut my spaghetti squash about half an inch off of the top and bottom, and discard those pieces. Then I cut the squash crosswise into rings about 1-inch thick, and run my knife around the inside of the rings to cut the seeds out. Drizzle the olive oil over the baking sheet, then spread the squash rings over it, moving them around a little so that the undersides are evenly coated with a little bit of oil. Season with salt and pepper, then flip the rings over and season again. I roast it in a preheated 400°F oven until the squash is tender, about 30 minutes. When the squash is done, I set it aside on the counter to cool for about 10 minutes and then I just pull it apart with my fingers. I throw the skin away but the squash itself comes apart so much easier with using my fingers then it does use a fork. 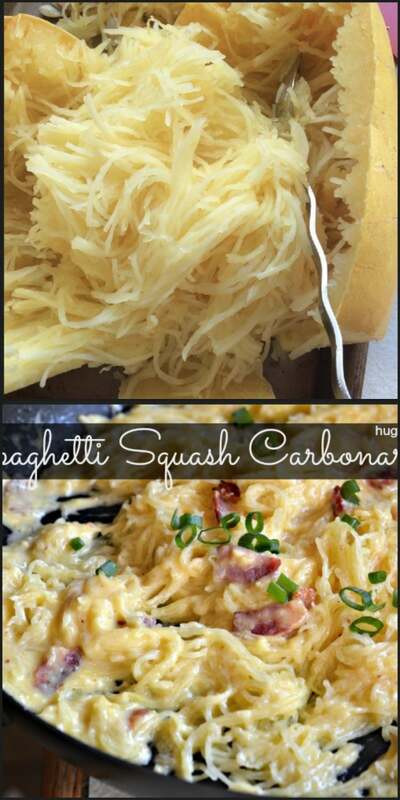 This works well for me for any spaghetti squash recipe. tried this recipe yesterday. It was good but was too heavy for my taste buds. Is there a way we could lighten this up? I agree with some of the others the raw egg gave me the chills. Can I substitute it with something else? Thank you! Looks yummy, healthy and your pics look awesome! I never had spaghetti squash before and wanted to try an alternative to pasta. Made this recipe tonight and will definitely put this in the rotation. It was soo good. I added some cream and used turkey bacon. Thanks for this recipe! I added Greek plain yogurt instead of Parmesan cheese and a can of sliced mushrooms. Spectacular!!! Spaghetti squash in crockpot works awesome. I really like this! I added cooked, crumbled sausage and some really spicy jalapeno peppers from my garden. Mmmm.. Delicious! Thank you for the recipe. I will be making this one again. Did you drain the bacon grease out of the pan or use it? It tasted delicious but I feel guilty eating all of that fat. Up to you, I didn’t get all that much-must have been my bacon! i just made this for the second time. Wonderful. I’m single and love taking my lunch to work. This is perfect to keep me going on a long work day. I make my Squash on Crock Pot. Cut in half short ways, remove seeds. 1/4 water bottom. Cook low 3 hours cut side down. Works great when you don’t want to heat up kitchen. I also made the squash ahead of time today. Still wonderful. I’ve really wanted to try this so finally bought the spaghetti squash, but as I’m reading it says to add the eggs, but to not cook them, i don’t think i could stomach knowing there are runny eggs in there. do you really need to put them in. Hi, I think there is an issue with the salt and pepper. Mine came out so salty that it wasn’t edible. Thus, I looked at the Emeril recipe you referenced, and it appears that he uses half the salt and pepper in the water where the squash is cooked. Just wanted to bring to your attention in case someone else brings it up. Disappointing…was so looking forward to this dinner. The measurements are the exact same. Us there anyway to make this a freezer meal? Couple questions: 1). Do you drain bacon grease? 2). Do you add spagetti squash as soon as you add the egg mixture? How do you make sure egg mixture is done? I have just found that I am gluten intolerant. My biggest love is pasta, even made my own pasta. This sounds like a great substitute. I will be in the grocery store tomorrow with a shopping list. Thanks for sharing this recipe with us. Can’t wait to slurp my new “noodles”. Can’t wait to TRY IT!!!! 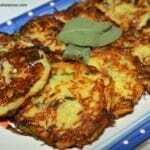 have been looking for different ways to make spaghetti squash! this looks delish! 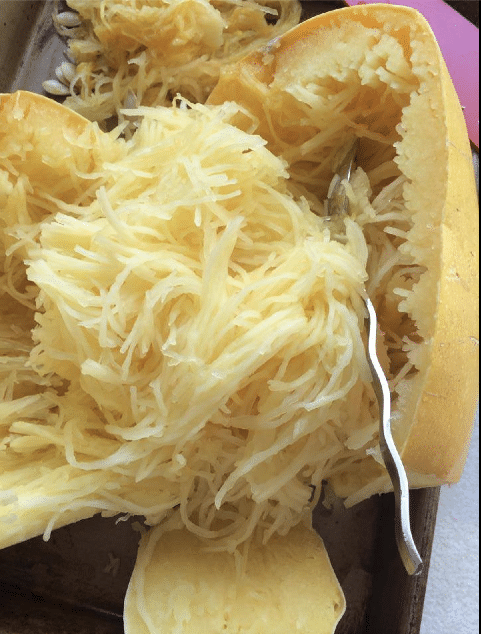 This is THE BEST way to cook spaghetti squash…I will never attempt to cut spaghetti squash before cooking it again! It is so easy to cut in half after cooking and it came out perfectly, looked just like pasta and resembled the texture! I used a spaghetti squash chicken alfredo recipe too and I felt more full and satisfied than eating it with actual pasta! This is a must try!! So tasty thank you! I “healthified” this even more using turkey bacon and reduced fat parm. With a medium squash it serves three. For Weight Watchers points it comes out to 6 smart points. Why do you sprinkle with salt and pepper before you roast and take out of the oven? Seems to me the salt and pepper won’t flavor the squash because it all falls on the pan. Did I misunderstand? Can’t wait to make this. Is there any way to list or find the nutritional info for this dish? I have all the ingredients to make it for my family this week but I’m on a very strict fitness plan. Thanks! Making this now. 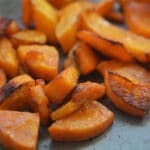 I always baked my squash in the oven, cut and seeded, but I followed the direction that came on the squash : so much easier. Microwave about 12 min or when done. When cool enough shred. I held it with a pot holder when still hot. 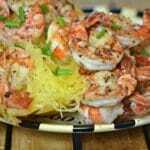 I found a recipe using spaghetti squash that is really easy and turns out perfect. Cut the squash in half and clean out seeds with a melon baller or grapefruit spoon. Put half side flesh side down in the microwave, no water. Loosely cover with a piece of paper towel. Microwave on high for 10-12 minutes or until flesh is tender. Let it sit flesh side down for 5 minutes. Scrape out the flesh with a for into strands. So easy and so good. I can’t wait to try your recipe tomorrow. 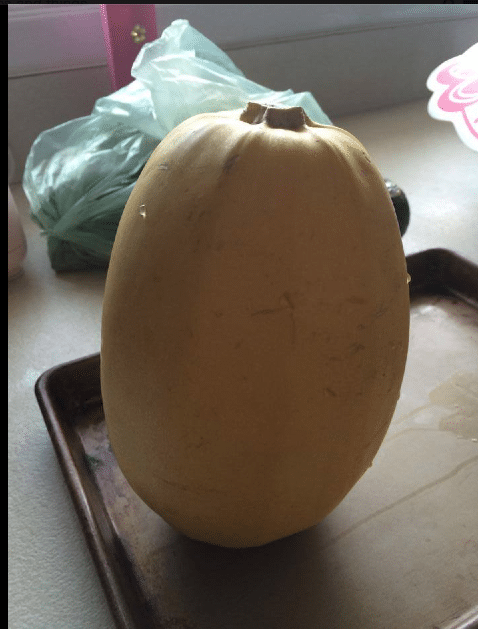 I must disagree with you – I don’t think spaghetti squash is anything like spaghetti!!! Although I must say I do love it, and this recipe looks ah-maz-ing!! I have a spaghetti squash sitting on my counter right now, and I think this will be how I cook it!! MMM! We love spaghetti squash! I usually just microwave it and serve with a little butter and salt. That lets the yummy flavor of the squash come through, plus it’s super easy! Thanks a lot for sharing such a fantastic post. This was soooo good! I added frozen peas, I think it goes well with the sweetness of the spaghetti squash. FYI leftovers are nearly as good!